Hi Guys!! I haven’t put up a movie review in a while now and I sincerely apologize. I’ve been busy saving lives here in Lagos. LOL. Anyways, my friend literally forced me to watch the movie I’m about to review and oh well, here are my thoughts. 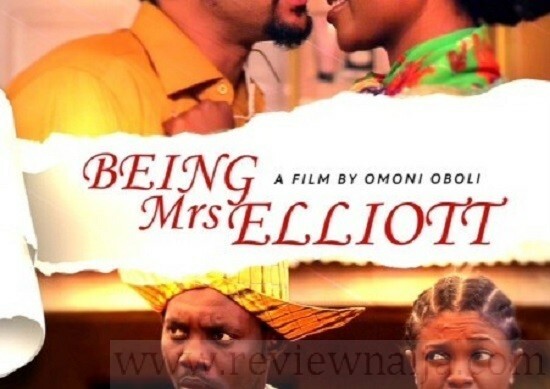 First of all, I present from the stable of DIONI VISIONS a 2014 movie titled “Being Mrs.Elliot”. I was pretty impressed with the production and directing. I was initially skeptical because I felt Omoni’s involvement was too much, but she nailed it. Ayo Makun aced his role as well. I think he was determined to prove to us that he is the all round package. Omoni’s acting was alright, and overall delivery in the movie was on point. Majid Micheal! He was the main reason why I decided to watch the movie and he didn’t deliver. I was so disappointed. I was also concerned about the switch in accents between Sylvia and Omoni. It was pretty confusing. Overall, I rate the movie a 6 over 10. There was really nothing captivating about the movie and I really expected so much. Majid lacked energy.